Headline: I’m trying to develop a new version of the FamilyShow that will use MVVM and work in both Silverlight (what I care about) and Windows Presentation Foundation (WPF) (what it was originally written in). I’ll start having a lot more posts about the differences between the two. I wish I’d started writing the differences sooner. I know that I’ve already encountered many that I will probably not remember. 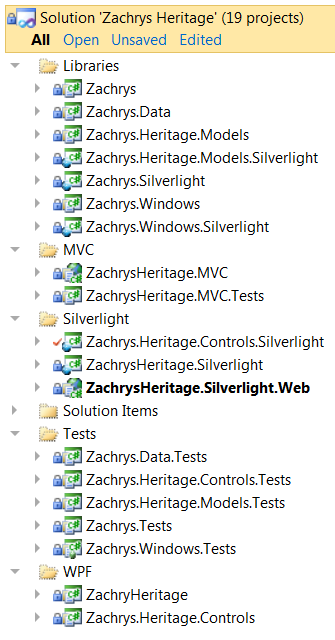 I also expect this to be pretty dynamic since I don’t really understand Silverlight (or WPF) all that well I might think something is not possible, but it is merely my lack of knowledge rather than the lack of Microsoft’s Silverlight or WPF features..
Years ago I put together a website for the Heritage of the Zachry Family. I’ve not touched the code since 2005 and have wanted to do a refresh. When Family.Show by Vertigo was first released I thought it would be pretty nice to have something like that. But of course it was WPF and not a web based technology. When Family.Show 1.0 (April 2007) came out Silverlight might have still been called WPF/e for Windows Presentation Foundation Everywhere. So while I thought FamilyShow was interesting, I just looked at is knowing it wouldn’t be possible. However, after many conversations with Microsoft employees on the vision for Silverlight I realized that “someday” it might be possible. 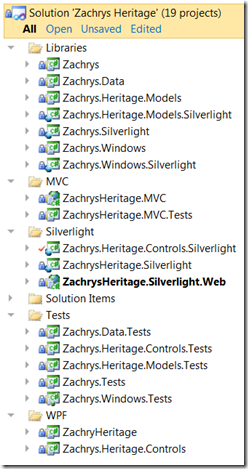 I suspect that with Silverlight 3.0 much would have been possible, and Silverlight gets better with each release. A final note on motivation. I am not a genealogist. As a matter of fact, I still have to look up even how to spell it. I enjoy technology. I use this project to keep myself abreast of Microsoft technologies. Having started this project the week before Thanksgiving this year I’m not very far into it. I really only ever seem to be able to make progress on the weekends. I have setup an MVC (Model-View-Controller), Silverlight, and WPF application in an effort to provide similar functionality in all three. Clearly, the MVC site will be very different from the other two projects. Here is my current project structure. As an overview, I’ll wrap things up. I could go on about various elements of the effort, but I think others will find it more valuable if I have individual posts about each topic rather than one very long post. This entry was posted on Sunday, December 5th, 2010 at 10:36 am and is filed under Technology. You can follow any responses to this entry through the RSS 2.0 feed. You can leave a response, or trackback from your own site. 44 queries in 0.219 seconds.